rosalie quinlans lovely block of the month stitcheries- block one. 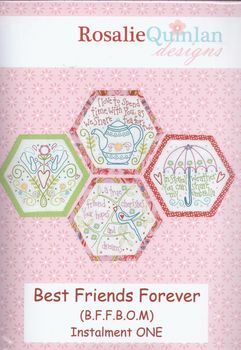 sayings with sweet picturese.eg i love to spend time with you, as we share tea for two. pre-printed linen includes 4 designs and you could cut them into squares, circles or as pattern, hexagons. just lovely!